British business is bullish about raising debt despite uncertainty over Brexit and other headwinds. 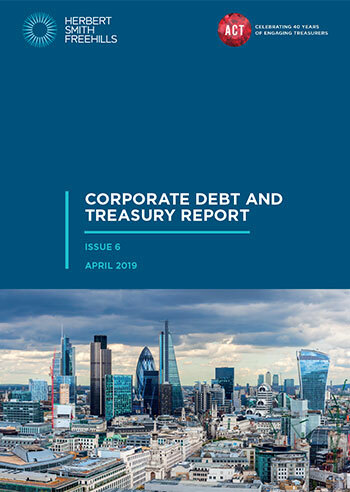 For a sixth consecutive year, Herbert Smith Freehills LLP has surveyed and interviewed CFOs, treasurers and other senior finance professionals in large UK listed corporates and equivalents for our annual Corporate Debt and Treasury Report. Working alongside the Association of Corporate Treasurers this year, the research has benefited from their insights together with the views of over 75 UK corporate treasurers, finance directors and CFOs. "2019 will pose a number of challenges and opportunities for treasurers; whilst not directly impacting on debt raising, the consequences of Brexit and the wider economic headwinds will inevitably result in incremental planning being required by treasurers including the continued development of a wider set of creditor relationships across multiple debt markets. In addition, the growing interest in ESG principles will touch on a number of corporate treasury work streams as will the phasing out of IBOR reference rates." We hope you find these results informative and would like to thank those who participated in our research. In particular, we are grateful to those who took part in our follow-up interviews to discuss the survey results. Please contact any of the team below if you have any comments on the report or would like to discuss any of the issues raised. Some of the themes explored in this report are necessarily only addressed in headline terms. During 2019 we will issue short form, practical insights on some of these issues and share views from other treasury professionals. If you would like to receive those please email. Kristen specialises in corporate debt and acquisition finance and providing general treasury advice. Amy is a debt capital markets lawyer based in London. Nick is a Partner in the London finance practice specialising in derivatives and structured finance. Gabrielle is a U.S. Finance Lawyer with particular expertise in Leveraged Finance.